Princeton University Press, 9780691160825, 377pp. 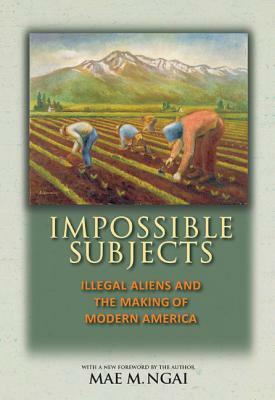 This book traces the origins of the "illegal alien" in American law and society, explaining why and how illegal migration became the central problem in U.S. immigration policy--a process that profoundly shaped ideas and practices about citizenship, race, and state authority in the twentieth century. Mae Ngai offers a close reading of the legal regime of restriction that commenced in the 1920s--its statutory architecture, judicial genealogies, administrative enforcement, differential treatment of European and non-European migrants, and long-term effects. She shows that immigration restriction, particularly national-origin and numerical quotas, remapped America both by creating new categories of racial difference and by emphasizing as never before the nation's contiguous land borders and their patrol. Mae M. Ngai is professor of history and Lung Family Professor of Asian American Studies at Columbia University. Her books include The Lucky Ones: One Family and the Extraordinary Invention of Chinese America.